STARKE, Fla. (Sept. 11, 2014) — On July 14, 2014, during the 153rd Finance Battalion’s annual training at Camp Blanding Joint Training Center (CBJTC), the R3SP Program hosted a Physical Readiness Workshop for 153rd Soldiers. Participants learned the fundamentals of the Army’s Physical Readiness Training (PRT) program to include preparation, conditioning, endurance and recovery drills. 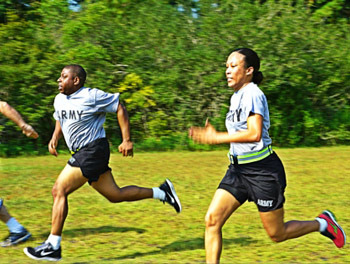 The new Army PRT program is an overhaul of the Army’s physical fitness training regime. The workshop was led by an Army Master Fitness Trainer Sgt. 1st Class Robert Eads. The goal of R3SP’s physical readiness workshops are to update FLARNG Soldiers and leaders on the Army’s relatively new physical training program as prescribed by FM 7-22. The end state is that FLARNG units will have the tools and knowledge to emplace a standardized and enduring PRT program.